Days of Wonder had a new expansion for Ticket to Ride available at Essen this year – a combination of two new boards with an Asian theme. This box is the first (of hopefully many) Map Collections. In fact, the second map collection, containing maps related to India, should be available in the very near future. The TtR:Asia Map Collection contains two maps. 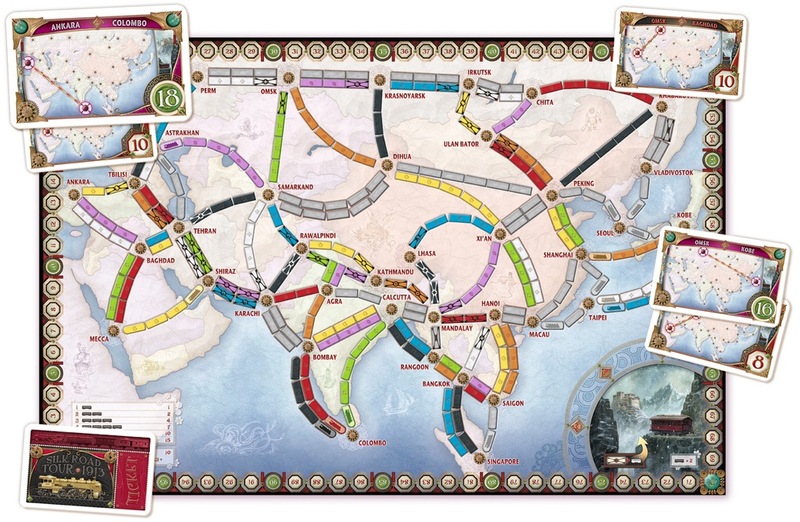 The first map has been designed by Alan R. Moon, the designer of the original Ticket to Ride game, and gives players a new way to play the game – in partnership! Above, you see the board for the Team Asia variant. 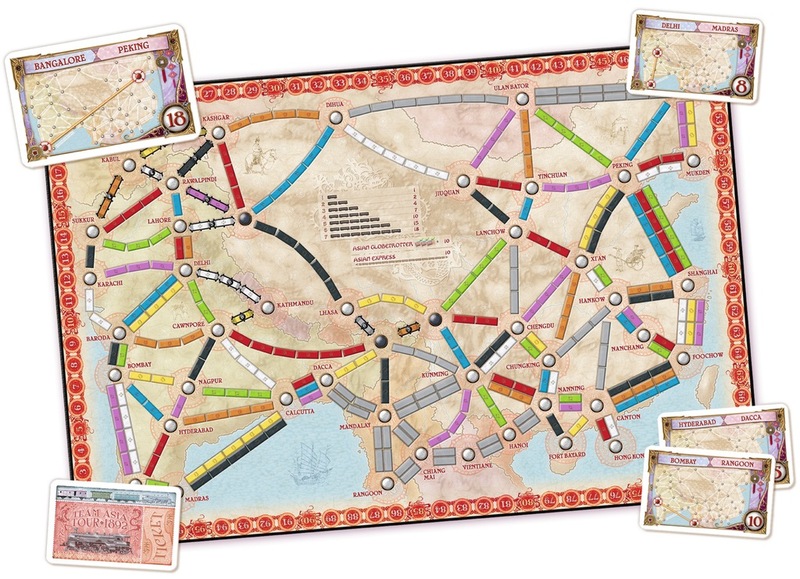 You will need to have a copy of the base Ticket to Ride game in order to provide you with most of the trains you need as well as the train cards. However, all the tickets used in this game are given in the expansion box. So, in the Team Asia version, you and your partner sit next to each other, and you will take turns one after the other. There is a card rack placed between you and your partner where you store train cards and tickets that both players on your team can use. Each player in your partnership will also have train cards and tickets in their personal hand which are not shared with the other. How the cards are split up are simple… When you draw cards from the supply, you still draw two cards (or one face up locomotive) as you do in the base game. One of these cards is placed in your personal hand and the other is placed on the shared rack. If you only draw the locomotive, it goes into the shared rack. If you draw tickets, exactly one must be placed on the rack, any others that are kept go into your personal hand. However, you can take an entire turn to add two tickets from your personal hand to the shared rack. Gameplay is also very similar to the regular game. The one difference is that you can spend cards from both your personal hand as well as from the shared card rack when building track. Both you and your partner share a color, and your score is kept together – though you do have separate train supplies. Each player in the game gets 27 trains. If you play all of your trains before the game ends, you simply can’t play anymore – you can only draw train cards or tickets! The game enters the final turn when any one team has a combined total of 4 or fewer trains after either has finished their turn. At this point, all players, including the player who triggered the end, gets one more turn. So, how does it work? Quite well. I’ve played the game three times now in partnership mode, and it is definitely a nice way to play the game when you have 4 or 6 players. There is a fair amount of strategy trying to decide which train cards go to the rack and which stay in your hand. The ticket situation also can get a bit tricky. As you can only put one of your tickets on the rack, there are plenty of destinations that you want to get to that your partner doesn’t know about! The big question is whether or not it is worth giving up a turn to give the information in two tickets to your partner. 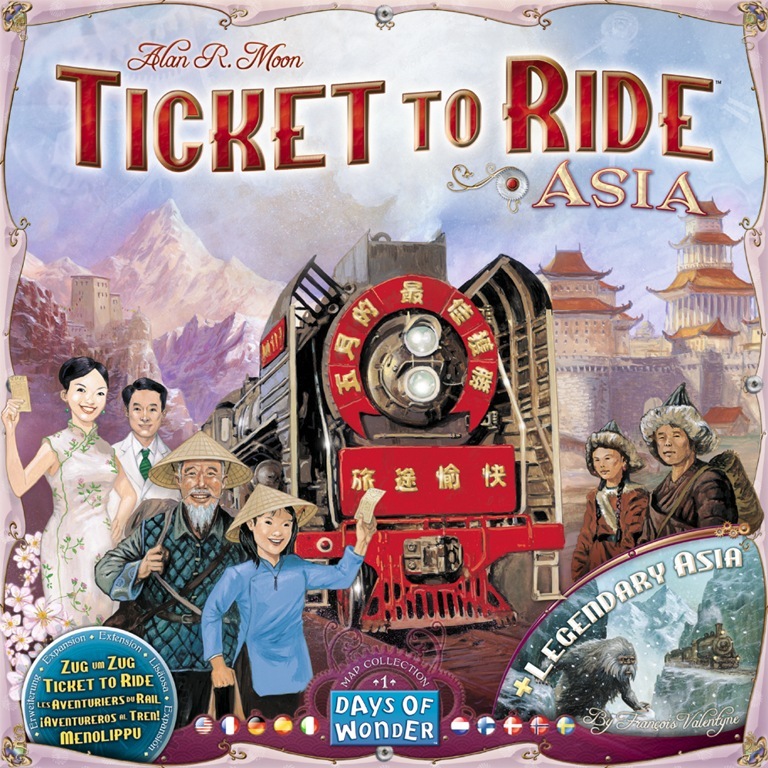 The team rules also allow for a sixth player to enjoy a game with the group – and TTR:Team Asia is one of the few games that plays six well. Normally having 6 at a game night would prompt me to try to split up into two tables of 3, but this is definitely an excuse to keep everyone at the same table. The other side of the mapboard gives you the Legendary Asia map. This map was designed by Francois Valentyne, and it was one of the prize winning entries from the contest sponsored by DoW earlier in 2011. Long and short destinations – there are 6 Long Tickets and 30 Short tickets in the game. You get 1 Long and 3 Short at the start of the game, and you must keep at least 2. The ticket deck used in the game consists of any Short tickets not dealt out at the beginning of the game. The Long Tickets are worth a lot more, but they’re also harder to finish! Mountain Routes – These routes are different than seen in any previous expansion. Mountain routes have at least one space that has an “X” on it. When you claim this route, you play the matching number of cards (of the matching color), and place the trains on the board. You also then have to discard one additional train piece for each space with an X on it on the route. These discarded trains score you 2 points immediately, but they can’t be used for anything else. There are even a couple of double routes in the game where one passage has Xs and the other doesn’t! I have only played this version once, and it was interesting. The Mountain Routes were the thing that was new to me – and it did prove to create some tough decisions later in the game as you tend to need every train you can get. I did manage to have the end sneak up on me as one of my opponents managed to play 4 trains on a short route (2 to the board and 2 were discarded), and the game ended at least one turn earlier than I had expected, and I ended up missing a few tickets as I was one connection short when the game ended early! I definitely like the ideas in Legendary Asia, but I suspect that it is the Team Asia map that will cause me to take this one off the shelf more. Rick Thornquist (1 Play of Team Asia): I’ve only played the team version once, but I liked it a lot. The shared cards idea works very well and with it you can subtly communicate with your teammate what you are doing and what you need. I don’t play a lot of Ticket to Ride these days, but put this one in front of me and I’ll gladly join in. Patrick Brennan: There are some nice maps to explore, but the real addition is here the team play. You play side by side. You share two tickets and have 2+ other private tickets which must not be shared. Unless you spend a turn to turn 2 private tickets into shared tickets so you can work together. That’s a first key new decision. Secondly when you draw train cards, you keep one and place the other into a common pool with your teammate that either player can draw from when completing a link. What you play in here (in particular later in the game once foundation links are out) can give good hints to your partner on where you want links to go. The most controversial part of this expansion is the info-sharing rules – you can’t exchange game information. Which technically means a silent game – no groans, no cheers, no phews, no “yes, well done”. Because all of these give information as to intentions. It ratchets up the tension, but also the potential for exasperation. But I want the experience to be a shared social for this light type of game, so the trick is finding a balance that all the players are happy with where you can actually enjoy your shared successes through the game and have it not be construed as too much table talk by the other team. A tricky balancing act to achieve with overly competitive players. Hopefully you get there, because when you play side by side there’s new things to consider like double block plays, and follow my lead plays, which are interesting to explore and build on. Anyway, this team-play variation in itself is probably enough to justify the expansion because it adds a meaningfully different experience to the brand. Valerie Putman: I have only played the team Asia board (and only played it once). I loved it! It gave Ticket to Ride a whole new level of drama and excitement (or angst as your partner draws tickets instead of laying trains when you have unfinished destinations and the other team is clearly pushing to end it). It was unusual to have team members play consecutively instead of alternating with opponents (as you find in most team games), but it clearly worked. In general I am a fan of new maps for games I enjoy and this one was exceptional! Larry Levy (1 play of Team Asia): Like most of the others, I’ve only played Team Asia and I really enjoyed it. I agree with the other comments about all the interesting tricks you can explore with partners sitting side by side, along with the challenge of deducing what tickets and train cards your partner has. My only concern after one game is that good luck with having your tickets mesh well with your partner’s might turn out to be somewhat unbalancing. But this is one of the best new additions to the Ticket to Ride franchise I’ve seen in a while and I could easily see my rating rise to “I Love It!” once I get the chance to play it some more. Joe Huber (1 play of each): The partnership game is really interesting – the ability to set up your partner means that – unlike nearly every other partnership game, where the roles are balanced – your choice of seat actually determines the role you need to play. That’s a really nice innovation, and allows the game to not feel like simply another Ticket to Ride variant. The Legendary Asia map, in contrast, is quite pleasant but not nearly so distinctive. The addition of the ability to discard trains is interesting enough that those who enjoy the base game and are looking for variety might wish to try it out, but it’s really the partnership game which makes this expansion tempting for me – even though I assiduously avoid expansions. Mark Jackson (3 plays of Legendary Asia): I’m really looking forward to trying the Team Asia map… but I’ve found the Legendary Asia map to be a worthy expansion in & of itself. The discarding train mechanic makes for a slightly shorter game… and giving players ways to push the timer makes some common Ticket to Ride strategies a bit riskier. There are fewer long runs on the Legendary Asia board & fewer long tickets (in fact, long tickets are in a separate small deck which are only given out at the beginning of the game). I’ve played with 2 players & 5 players – and both worked quite well. The partnership variant sounds very interesting, indeed. It reminds me of Knizia’s partnership variant for his card game, Korsar, which also seats partners next to each other, and is also quite fun. A friend, a Winsome stalwart, played the partnership game recently and said it was a blast. If this does make it into our gaming group, I may have to restrict whom I’ll play it with. There are a few who find nothing more titillating that devising unvoiced information passing schemes using nothing but card play. I can imagine them concocting all sorts of ways to pass each other private information, using card orientation and placement on the shared holders. Gary, I agree that there is (sadly) room for shenangians as you postulate. Our group was playing in a much more lighthearted manner, and simply tried to keep from telling our partners our plans (and what cards we had). I’m guessing that we even gave away some information to each other, but it didn’t seem to change the outcome of the game nor the enjoyment of it. It’s definitely a game to be tried if you like T:tR! It’s also an issue in Tichu. I’ve played Legendary Asia numerous times already and find it a nice variation of TtR (which is one of all-time favourite games, so any variation there is very welcome!). But it’s the Team game that really makes the expansion shine. It’s different, devious and delightful. I just purchased this and am excited to try it. Team play usually doesn’t appeal to me, but this just might.